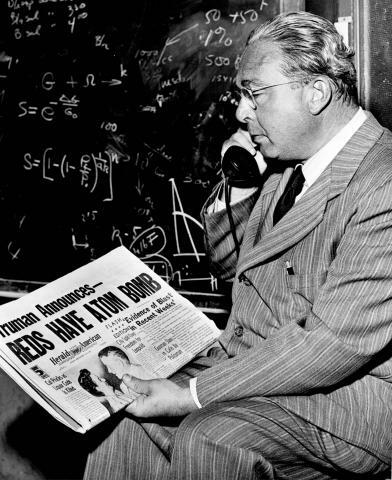 Leo Szilard was a Hungarian-American physicist and inventor who developed the idea of the nuclear chain reaction in 1933. He was instrumental in the beginning of the Manhattan Project, writing the letter for Albert Einstein’s signature in 1939 encouraging the US to begin building the atomic bomb. He was also chief physicist at the Chicago Met Lab from 1942 to 1946. Szilard helped build Chicago Pile-1, the first neutronic reactor to achieve a self-sustaining nuclear chain reaction. Szilard patented creating a neutron-based chain reaction in 1934, although, as historian Alex Wellerstein explains, his ideas in the patent had some problems scientifically and would prove to be wrong in parts. In 1955, Szilard and Enrico Fermi jointly received the patent for a neutronic reactor. Despite his express desire to develop atomic weapons before Nazi Germany, Szilard publicly stated his opposition to using the bomb in war. A pacifist and contrarian, his most prominent moment of opposition to the bomb’s use came in July 1945, at the same time as Manhattan Project leaders prepared for the world’s first nuclear test at the Trinity site. In the spring of 1945, Szilard presented a memorandum with his arguments to James F. Byrnes, who at that time was about to be named Secretary of State. Unfortunately for Szilard, Byrnes flatly refused to share the memo with Truman. Despite his rebuke by Byrnes, Szilard was still adamant in his beliefs, and worked to draft a petition with signatures of Manhattan Project scientists and technicians. This time, however, General Groves insisted that the petition make its way through the chain of command through official channels only. Szilard, adamant that the atomic bomb would have disastrous geopolitical consequences, crafted a petition arguing that atomic attacks on Japan "could not be justified, at least not until the terms which will be imposed after the war on Japan were made public in detail and Japan were given an opportunity to surrender." That demand was in fact more moderate than Szilard’s original proposition, which pleaded for the use of the bomb to be avoided at all costs. He was not alone in his concerns about the military use of nuclear weapons. Many of the scientists and technicians who understood the destructive potential of the atomic bomb felt that the U.S. should first conduct a peaceful demonstration to warn the Japanese of the consequences of refusing to surrender. Szilard and several other Met Lab scientists had collaborated on the Franck Report, issued in June of 1945, which called for a demonstration. However, the Franck Report was rejected by the scientists who served on the Interim Committee's Scientific Panel - J. Robert Oppenheimer, Enrico Fermi, Ernest Lawrence, and Arthur Compton - who wrote, "We see no acceptable alternative to direct military use." At Oak Ridge, an informal organization known as the Association of Oak Ridge Scientists at Clinton Laboratories was formed to discuss the moral questions raised by atomic weapons as well as the possibility for atomic peace. The petition arrived at Oak Ridge with another Hungarian-American physicist, Eugene Wigner. There the petition found many willing signers, and quickly spread around the site before military authorities halted it. They argued that the petition was a security risk because it implied that the project possessed a useable atomic weapon. The petition fared better at Oak Ridge than at Los Alamos. Another Hungarian-American physicist, Edward Teller, brought the petition to that site with the intent to gain signatures there too. However, at the advice of J. Robert Oppenheimer, he ultimately decided not to do so. "Oppenheimer talked me out of it, saying that we as scientists have no business to meddle in political pressure of that kind. We know too little about that. I am ashamed to say that he managed to talk me out of the right intention," Teller later told interviewer S.L. Sanger. The petition never gained traction outside of Chicago and Oak Ridge. Szilard’s ultimate goal was for President Truman to read his petition and consider the moral questions raised by the use of the atomic bomb. 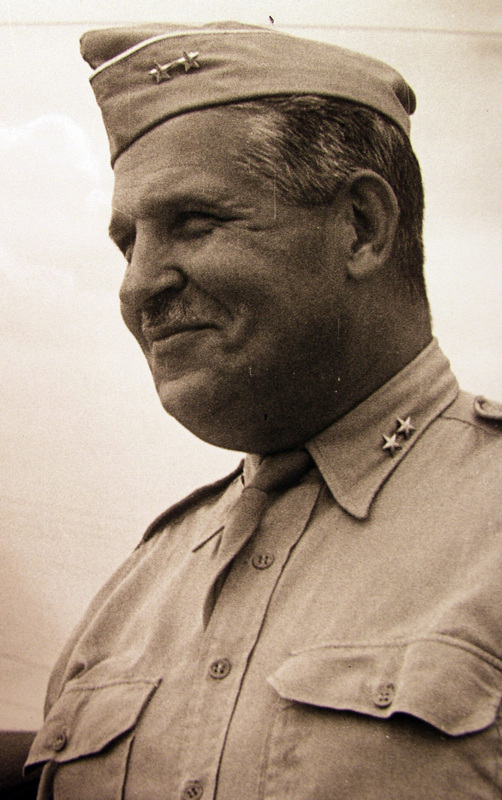 General Leslie Groves and the military were convinced that this kind of meddling would undercut the entire project and jeopardize its secrecy, and made every effort to prevent the petition from getting to Truman’s desk. Groves’s judgment was informed by his longstanding distaste for Szilard. Szilard’s questioning and contrarian nature, which made him such an effective scientist, was ill-fitted with Groves’s constant demands for secrecy and compliance during the Manhattan Project. This initiated a slow process wherein Szilard passed the petition to fellow physicist Arthur Compton, who passed it to Kenneth Nichols, who passed it to Groves himself. Groves did not send the petition to Secretary of War Henry Stimson until August 1945. At that point, Stimson—with President Truman—was still in Europe. Upon receiving the petition from Groves, Stimson’s assistant simply filed it “Secret,” and it never reached Stimson or Truman. Groves was also able to divert the petition inadvertently. His insistence on compartmentalization—limiting individual knowledge about the project to the absolute minimum that each worker needed in order to complete their job—restricted the number of people who could sign the petition. Many people working on the Manhattan Project were unaware that they were making a bomb, much less the world’s biggest bomb. There was a relatively small audience of people at any given facility who were knowledgeable enough about their jobs to even consider signing the petition. Many in the military had a stated disdain for the petition. After the petition ultimately failed and the atomic weapons were used on Japan, Groves sought to find incriminating evidence of wrongdoing of any kind that he could use to punish Szilard. Part of that effort included writing to Winston Churchill’s scientific advisor, Frederick Lindemann, to see if Szilard had mentioned classified information to the British government, potentially subjecting him to the Espionage Act. This effort and others were ultimately unsuccessful, and Szilard emerged relatively unscathed, albeit without much influence on American nuclear policy. Unlike Szilard, a world-class physicist with international clout, many of the petition’s signers were lower-level project staff and scientists. While this exempted them from some of the scrutiny faced by Szilard, it also offered them little protection. Few of the petition’s signatories were able to continue working in the weapons industry after the war. Many were unable to attain the necessary security clearance, while others maintained their moral objections to the production of nuclear weapons. Szilard would not be the last member of the scientific community to oppose the military-approved nuclear strategy. J. Robert Oppenheimer would become one of many scientists to come under fire in the next decade for opposing the proliferation of thermonuclear weapons. In fact, several of those scientists were subjected to hearings and investigations based on their objections. Arguably, Szilard’s petition contributed to a distrust of scientists within the military that would lead to their investigation by the House Un-American Activities Committee and the Atomic Energy Commission during the 1950s. That was certainly not the intended legacy of a man who had deep concerns about the use of atomic weapons and the possibility of maintaining liberty and peace in a nuclear era. To read a copy of Szilard’s final petition, click here. Szilard biographer Gene Dannen's website contains a wealth of information on Szilard and the petition. William Lanouette, "Genius in the Shadows: A Biography of Leo Szilard, the Man Behind the Bomb"